Making the everyday magical in your photography can often seem like a daunting challenge, but with a little shift in perspective, some technical tips, and a bit of creative inspiration, you can turn "normal" into "extraordinary." Looking at things with different perspectives is a key to making the everyday extraordinary. The proverbial "stop and smell the roses" expression isn't for nothing. It really can change your average day into something exceptional when you slow down, calm your mind, and see the details in life. Looking towards the small elements, the nuances, you can see true beauty. When the large picture becomes clouded and full of chaos or appears dull, take a moment to slow down and find beauty in the details with the following helpful tips. How do we find ourselves in the normal? Start by seeking out authentic moments. Once you become an observer and allow life to happen around you, you can begin to see extraordinary things. There is no need to force this. The more relaxed and aware you can become, the more creative and beautiful your images will become. 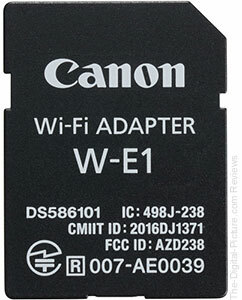 Where is the Canon W-E1 Wi-Fi Adapter? The Canon W-E1 Wi-Fi Adapter Announcement stated that accessory would be available "early September 2016." Because a firmware update was necessary for compatible DSLRs to utilize the adapter, we expected a 7D Mark II firmware update would appear around the same time (which it did, September 8). But as September draws to a close, the W-E1 still hasn't shipped to preorder customers (myself [Sean] being one of them). What caused the W-E1's delayed release? When can we expect the W-E1 to be available? Unfortunately, there has been no official word from Canon pertaining to the delayed product availability. Therefore, we have no idea why the Wi-Fi adapter was not released at the beginning of September as scheduled. However, after numerous inquiries to various contacts over the past two weeks, I finally received word from two independent sources that the W-E1 would likely be available the last week of October (according to one source) or the first week of November (according to the other). Regardless of whether the W-E1 is available at retailers the last week of October or the first week of November, all indications are that preorder customers will be waiting another month before Wi-Fi adapters land on their doorsteps. B&H has the Canon W-E1 Wi-Fi Adapter available for preorder. Permalink: Where is the Canon W-E1 Wi-Fi Adapter? B&H has the Tamron SP 150-600mm f/5-6.3 Di VC USD G2 Lens for Canon and Nikon in stock with free expedited shipping. As I mentioned in our Infrared Camera Conversion Review, having an infrared camera at hand greatly increases the "great light" portion of the day. It's well known that golden hour (shortly after sunrise and just before sunset) provides the greatest opportunities for capturing scenes with beautiful, interesting and/or compelling light in traditional photography. Typical landscape scenes don't as good in the middle of the day. And since there are a lot more hours in the day that aren't golden hours, that presents a bit of a problem from an inspiration standpoint for landscape photographers. As landscapes captured in IR typically look best with a lot of hard, midday sun, getting an IR-converted DSLR can provide ample opportunities to capture beautiful landscapes with the sun right overhead. Sometimes I'll simply grab my Super Color IR-converted EOS 7D and EF-S 10-18mm f/4.5-5.6 IS STM and/or EF-S 24mm f/2.8 STM and walk around my neighborhood to see what piques my interest. Typically speaking, my neighborhood isn't very inspiring from a landscape photography perspective. However, there are a few spots nearby that tend to draw my eye. This large oak tree in the middle of a field is one of them. When it comes to IR landscapes, I typically set my camera to aperture priority (Av) mode at f/8, ISO 100 and let the camera choose the shutter speed (dialing in exposure comensation if needed). Considering that IR landscapes are typically captured at times with an abundance of ambient light available, using f/8 allows me to achieve near maximum sharpness (though the setting is just slightly above the camera's diffraction limited aperture, or DLA) while typically keeping everything in focus (assuming the point of focus exceeds the hyperfocal distance for the situation). For the shot above, I used the EF-S 24mm f/2.8 STM and the exposure settings were f/8, 1/160 second and ISO 100. I first inverted the red and blue color channels in post processing and then desaturated the yellow hues to achieve the traditional IR white foliage look while maintaining the blue color captured by the Super Color IR sensor. Click on the image above for access to a higher resolution version. 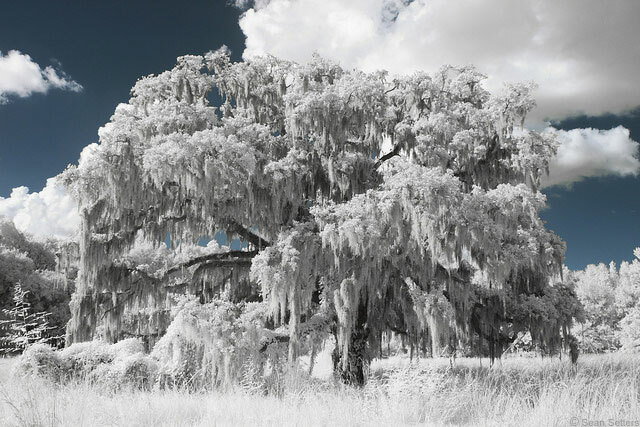 Learn more about infrared photography and IR conversions in our Infrared Camera Conversion by LifePixel Review. As usual, B&H will be closing in observance of Rosh Hashana. Below are the closing details. B&H will be closed starting at 1pm ET on Sunday, October 2 through Wednesday, October 5. We will reopen at 9am ET on Wednesday, October 5. Online ordering will pause beginning at 6:30pm ET Sunday, October 2 until 7:45pm ET on Tuesday, October 4. Orders placed before 12am ET on Sunday, October 2 will be processed prior to the Holiday closing. Orders placed after this time will be processed when we reopen on Wednesday, October 5. 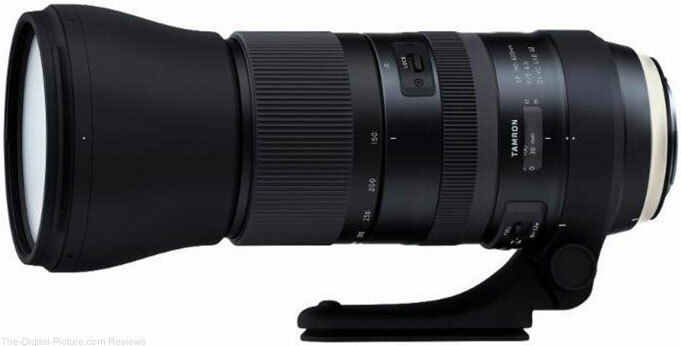 B&H is expecting to have the Tamron SP 150-600mm f/5-6.3 Di VC USD G2 in stock later this afternoon with free expedited shipping. Read the entire article on the Canon Professional Network. B&H carries the Canon EOS-1D X Mark II. Learning keyboard shortcuts is the best way to work faster and more efficiently in Photoshop. In today's episode, we explore 5 Keyboard Shortcuts that are sure to speed up your workflow in Photoshop. Learn how to create keyboard shortcuts in this episode. There is no default keyboard shortcut for making a layer mask - we suggest making one to save time! To save images with the correct settings for display online, be sure to use "Save for Web and Devices"
Right-Click & Drag Left and Right to change brush size. Right-Click & Drag Up and Down to change brush hardness. To change layer opacity, first select the Move Tool by pressing "V". This will make any changes applicable to the layer, not a specific tool like the Brush Tool. Use the numbers on the top of the keyboard to correspond to layer opacity. "1" will make opacity 10%. "5" will make opacity 50%. Adorama has the Canon EOS 5D Mark IV in stock. Amazon expects to have the 5D IV in stock on October 1. Which 50mm Prime Lens Should I Get? A wide-aperture 50mm prime lens is a staple in the photographic world. It was often included in 35mm film DSLR kits because of its versatility and familiar angle of view (the focal length approximates how we see the world with our own eyes). With such deep roots, widespread availability, general lack of distortion and the ability to tackle a myriad of situations, it's no wonder why 50mm primes are so popular. For the purposes of this comparison, we're only going to compare lenses featuring wider-than-f/2 apertures that are capable of autofocus. While there are certainly great manual focus 50mm primes out there (the Zeiss Milvus 50mm f/1.4 being one of them), the lack of AF makes them more of a special use tool rather than a versatile, general use prime. And since distortion is generally not very significant in 50mm primes, we won't be comparing that aspect of these lenses. At the top of the list (in terms of maximum aperture and price) is the Canon EF 50mm f/1.2L USM. This high quality L-series lens has been Canon's top tier 50mm prime for a decade now. Unfortunately, its age is starting to show. If you need the widest aperture you can get in an EF-series lens, it's your only choice. However, the lens has a "dreamy" quality at its widest aperture. A more specific way to describe the lens is it's a little soft in the center and very soft in the corners wide open. With it, you'll see pretty heavy vignetting until f/2 and chromatic aberrations (CA) will be evident the lens' widest apertures. And on top of that, it's by far the most expensive option in this comparison. So what are the Canon EF 50mm f/1.2L USM's pros? Although it isn't Canon's fasted focusing USM lens, it is fast enough to be effectively employed for some sports uses. And unlike its longer focal length big brother featuring an identical aperture and all but one other lens in this comparison, the 50L is weather sealed (with a front filter in place). While the naming convention Sigma uses for its Global Vision Lenses still confounds us, there's no doubt that Sigma's reputation has been bolstered by its Art and Sports series lenses. High quality construction, sleek styling, excellent optics and reasonable price have become hallmarks of the Sigma brand. The Sigma 50mm f/1.4 DG HSM Art seems to check all of those boxes. The Sigma 50 Art is impressively sharp wide open and improves to tack sharp across the frame at f/2.8. Vignetting, flare and CA are all well-controlled. One more significant benefit of the 50 Art is Sigma's 4-year warranty (1 + 3 year extension in the US market) compared to Canon's 1-year warranty. As is too-frequently typical with third-party lenses, you can expect the Sigma 50 Art to focus less consistently accurately than the typical Canon USM lens. While results in One Shot mode may leave you scratching your head from time to time, AI Servo performance is noticeably better. I [Sean] have used the Sigma 50 Art for a number of indoor basketball games and, while not perfect, it performs admirably at the task. That the AF can be customized via the USB Dock is a nice advantage. If there's a shot you cannot afford to miss (like a bride & groom's kiss at the end of a wedding ceremony), I'd suggest using Live View shooting to minimize the risk of missing focus. As Live View uses data coming from the actual sensor to achieve focusing, phase-detect calibration issues can be avoided. Yes, I know that the Tamron 45mm f/1.8 VC doesn't technically qualify to be included in this comparison, but I think it's close enough in focal length to deserve consideration. Along with the 35mm variant, the 45mm f/1.8 VC became Tamron's first in a new series of lenses competing directly against Sigma's Global Vision Lens line (see Sigma GVL hallmarks above). And just like Sigma's GVLs, the Tamron's AF can be customized via a similar USB device. Like the Canon, this lens features weather sealing. While the Tamron's maximum aperture may have a 2/3 stop narrower aperture than the Sigma, its Vibration Control (a unique feature among its competitors) capable of up to 3-stops of assistance more than makes up for the difference in aperture while photographing static subjects. The Tamron features nice, relatively even sharpness across the frame wide open and improves noticeably at f/2.8 where results are great with minimal vignetting. Flare performance is good at wider apertures but results are less visually pleasing once stopped down to its narrowest aperture. Chromatic aberrations are decently controlled. The Tamron features the highest maximum magnification (0.29x) among its 50mm prime competitors. As is too-frequently typical in third party lenses, you can expect less consistent AF results while using the Tamron 45 f/1.8 VC. We found center AF performance quite good (probably the best we've seen from a Tamron), but outer AF point consistency will likely be a problem for many. Just as with the Sigma, use Live View focusing for your fleeting moments using the Tamron. Introduced in 1993, the Canon EF 50mm f/1.4 USM is by far the oldest lens in this comparison and one of Canon's longest-produced (and still current) lenses. Its price point, wide f/1.4 aperture and better build quality than Canon's f/1.8 variants have made it an attractive investment for many photographers wanting explore the benefits of prime lenses. However, its performance compared to contemporarily designed 50mm primes may be considered lackluster. The Canon 50mm f/1.4 is very soft wide open across the entire frame but improves greatly at f/2.8. Keep in mind that for those who are stepping up from a kit lens with an f/5.6 maximum aperture at 50mm, the results of the Canon 50mm f/1.4 prime at f/2.8 may be worthwhile considering the 2-stop wider aperture advantage. Vignetting is very heavy at f/1.4 but clears nicely at f/2.8. Flare is very well controlled through f/8 (with a small amount of contrast lost) and minimal at f/11. With a mid-grade design that's now more than 20 years old, the 50mm f/1.4 USM is not the most durable or stylish 50mm lens. It should stand up well to typical use, though. It features a very attractive price tag compared to the other lenses listed above it in this comparison. However, as far as affordable pricing is concerned, there's another Canon 50mm variant that takes the cake. Canon's 50mm f/1.8 lenses have been the budget-conscious photographer's introduction to prime lenses for many years. Their newest variant features Canon's STM focusing technology which was developed to produce smooth (and quieter) autofocus results during video capture. And while the AF is not silent, it's significantly quieter than its predecessor (the EF 50mm f/1.8 II). And speaking of the 50mm f/1.8 II, the Canon EF 50mm f/1.8 STM features a long list of upgrades (more aperture blades, higher build quality, STM, higher maximum magnification, etc.) that make it a worthwhile replacement for Canon's most inexpensive lens. Unfortunately, a new optical formula was not one of the upgrades (though new coatings have been employed). The 50mm f/1.8 STM's sharpness is very similar to the Canon 50mm f/1.4 when both lenses are compared wide open, though the f/1.8 STM is noticeably better in the center. Sharpness improves significantly by f/2.8, but it still lags behind its f/1.4 cousin at the same aperture. The 50 f/1.8 STM features impressive, not-terribly-noticeable-wide-open vignetting results for a lens at its price point. At wide apertures, flare is mild but reduces to virtually nonexistent at f/5.6. Expect minimal CA when using this lens. Undoubtedly, one of the 50mm f/1.8 STM's most attractive features is its price point. To put it into perspective, you could buy 11 EF 50mm f/1.8 STMs and still have money left over compared to the investment required to add the Canon 50L (at US MSRP) to your kit. If you are a photographer who currently uses one of Canon's 18-55mm kit lenses and wants to experience the benefits that wide-aperture prime lenses have to offer, this lens is an easily justifiable investment. Before we move on, there are a couple of differentiating factors I didn't address above – size and weight. There is definitely a significant difference between the biggest/heaviest and the smallest/lightest options. If size and weight are a differentiating factor for your photography (especially important when traveling), use the table below to aid in your decision making process. * Manufacturer specs shown in absence of measured specs. As you can see, the 50mm(ish), wide-aperture prime lens market is not short on options. The fact that Canon has three 50mm lenses featuring an f/1.8 or wider aperture is a testament to this prime focal length's appeal. And the fact that third party lens manufactures are devoting significant resources to producing high quality 50mm variants is unsurprising for the same reason. For what it's worth, there isn't one right option when it comes to 50mm primes. The order of your own personal priority list – considering build quality, image quality, AF accuracy, size/weight and cost – will ultimately determine which prime lens deserves a place in your gear bag. I hope the comparison above has helped illuminate the right answer for you. Permalink: Which 50mm Prime Lens Should I Get? Thank you for choosing Nikon for your photographic needs.We plan to test Macintosh versions of the following software applications for compatibility with macOS Sierra. We will announce our findings once testing is complete. We cannot guarantee the compatibility of these applications with macOS Sierra until we have completed testing. It has become clear that the current version of the Wireless Transmitter Utility is unable to function properly under macOS Sierra. We do plan to update the Utility to provide compatibility with macOS Sierra, so we ask that you refrain from updating to macOS Sierra until the Wireless Transmitter Utility update becomes available. We do not intent to provide compatibility with the following applications. In addition, we do not plan to provide compatibility for other software, or SCSI- or serial-connection products. We apologize for any inconvenience this may cause. For more information regarding this matter, please contact Nikon Customer Support. Note that the EOS 6D's updated firmware does not include correction for the [incompatible] EF-S 18-135mm f/3.5-5.6 IS USM. Ever found yourself lost in the maze of codec options when shooting, editing, and delivering your video? You're not alone. In this video, Chase from Zacuto explains the basics of choosing and setting up your codecs for every step of your production. Concepts such as interframe vs. intraframe, color depth, and bitrates are explained as they pertain to your workflow. Wildlife is unpredictable – and too often lives up to the "wild" in its name. Getting warm light from a very late day sun to hit an animal directly from behind your back (shadow pointed to the subject) with a good background is challenging. 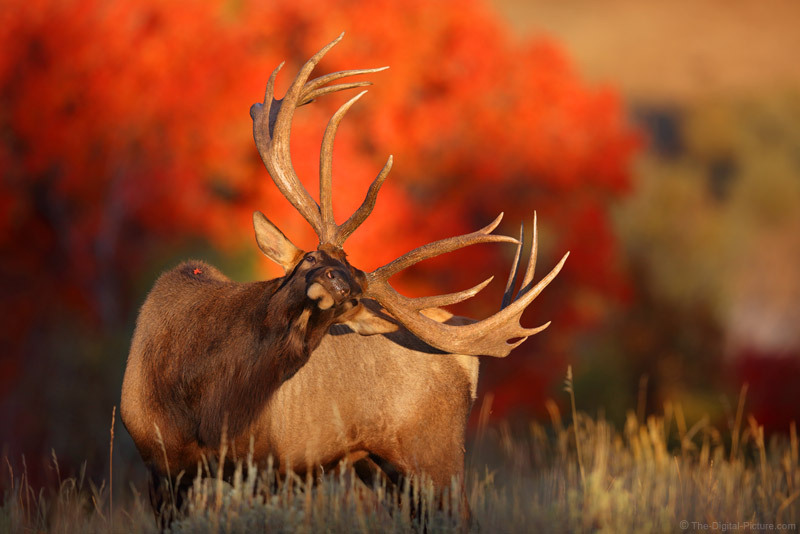 Having the animal be an incredibly-large bull elk and the background be maple trees in peak red fall color definitely increases the image value to me. Having the broadside bull scratch itself with its antlers, aligning the shoulders within a green portion of the background, the antlers within the glowing red section of tree and the head in front of the brightest background (high contrast draws the viewer's eye) was more than I thought to pray for. This huge 9x8 bull elk had been bedded in the sage and grass. The sun was setting rapidly and while I captured many images of the head and antlers rising above the obstructions, I really wanted a full (or nearly full) body image in this setting. Fortunately, that happened. I was in a great position when the elk stood up. However, the bull's head, looking forward, was in the shade of trees on the horizon behind me. The back scratch was precisely what I needed to leave only the legs in the shadows, completing the image. While I prefer to use completely manual settings, the light falling on the subjects was changing frequently and the shots were often being captured in haste. So, I opted to use manual mode with Auto ISO for much of my elk photography on this trip. The color of the elk bodies and their environment was neutral enough in brightness that, at most, only a small amount of exposure compensation was needed. In this case, I exposed this image 1/2 stop brighter than needed. The 5Ds R did not have any trouble recovering the red channel pixels that exceeded a 255 RGB value. This brightness adjustment left just a tiny patch of red pixels retaining 255 values, though even more headroom is available. Based on the movement of the elk at the time of capture, ranging from standing (often looking at me) to running away, this exposure method meant that I could simply roll the top dial to select the shutter speed I needed for the scenario (to keep the image sharp) while keeping the ISO as low as possible. If only one elk was in the frame, the aperture was nearly always intended to be set at f/4, so don't read anything into my f/4.5 actually used aperture for this image. I must have inadvertently (sounds much better than "user error") adjusted the rear control dial at some point during the action. Bull elk are huge and at the distance required to keep the entire elk in the frame, f/4 was still not shallow enough to completely erase the background in most scenarios encountered. The 600 f/4 is a large and heavy lens. Using it without support is asking for a shoulder injury. While a tripod with a gimbal head is the ideal support for this lens, I find a strong monopod (with twist-locks for quietness) to be much faster to setup and adjust. This speed is very important for positioning in wildlife photography as the subject seldom stays in place for very long. Setting up fast and quietly can mean the difference between getting a great shot and getting no shot. As you may have guessed, I have recently returned from a photography trip. This one was a 10-day wildlife and landscape adventure to Idaho and Wyoming. As usual, the trip was exhausting but amazing. The in-the-field experience is not only great fun, but also extremely important in fully understanding how gear works in the situations it is designed to be used in. This trip featured the new Canon EOS 5D Mark IV DSLR camera that arrived just prior to my leaving. I rotated the 5D IV and a pair of Canon EOS 5Ds R bodies between the primary lenses I was using at the time, namely the EF 100-400mm L IS II and EF 600mm L IS II for elk and other wildlife. The 5Ds R happened to be behind the 600 on this day and the resulting image is incredibly detailed, but I would not have been disappointed to have had the 5D IV behind this lens at this time. It too is a great camera. My 5D IV is quickly approaching 10k frames and completion of its review remains a very high priority. Question: Would you like this image better in a square/1:1 aspect ratio? A larger version of this image is available on SmugMug, Flickr, Google+, Facebook, 500px and Instagram. If reading from a news feed reader, click through to see the framed image.